Every spring, Outside Online awards their 2013 Gear of the Year to what they believe to be the best of the best when it comes to outdoor gear. This list includes everything from sunglasses, to paddle boards, to mountain bikes, to sleeping bags. While I haven’t gotten my hands on this gear, there’s a lot you can tell by just analyzing the specs and comparing it to the other top gear out there. I’m not going to waste your time with info on sunglasses or mountain bikes. 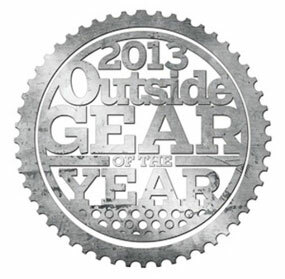 You can check out Outside’s 2013 Gear of the Year here and see all the gear that got top accolades. Instead, I’ll be focusing on the best hiking, camping & backpacking gear from their list and giving you my insider view as to whether or not it’s worth buying when compared to what I’ve previously rated as the best gear in that category. Psst — The links to retailers are affiliate links. This means that if you click one and purchase something within a set amount of days, I get a small commission. It doesn’t cost you anything extra, but means a whole lot to me as it helps put food on the table for my family and allows me to keep writing for you. You can learn more about my story and why I do what I do here. No way around it: The Kelty DriDown 16 degree sleeping bag revolutionizes the industry. Typically, the biggest drawback of a down sleeping bag is that it is rendered useless once wet. Sure, some companies have made baby steps forward in technology so that their shell repels some water. Marmot did that with the Plasma, which I still believe is the best ultralight sleeping bag. However, Kelty’s DriDown is a game changer. Sure, it has all the standard treatments, like baffle construction to eliminate cold pockets, hang loops for proper storage (learn more about storing your sleeping bag)… etc. But here’s the deal: Kelty’s DriDown individually treates each individual duck, making the down resistant to water. That’s right. Previously, the shell was only resistant to water. NOW, the DOWN ITSELF is water resistant. The result? It stays dry 7 times longer than competing sleeping bags. On the other side of the coin is the GoLite Z, which I have consistently ranked as the best sleeping bag. How does it stack up against its competitor? Now, it’s easy to declare the Z the winner here when looking at these competing categories. 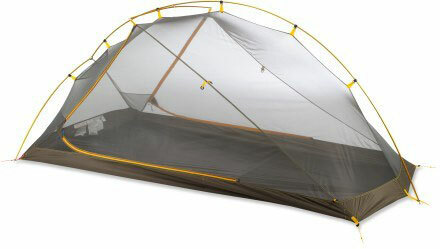 First, the Kelty DriDown is cheaper. Significantly. That extra 150 bucks can be dedicated toward an ultralight backpack and lower your backpacking weight down. And even though it has 250 less goose down feathers, it still has a temperature rating of 16F. I normally shoot for a 20F bag. Remember, more/bigger is not always better. And in this case, I don’t believe GoLite’s extra goose down and the 6 degrees of greater warmth outweighs the water proof(ish)ness of the Kelty DriDown. All links go directly to the product page so you don’t need to wade through their search. The GoLite Z is only available at GoLite.com. 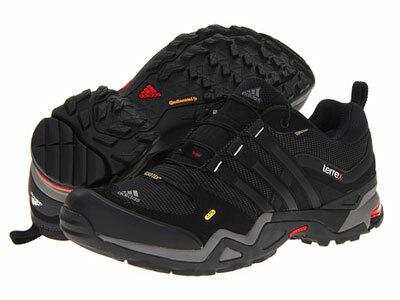 The Adidas Outdoor Terrex Fast GTX is a waterproof, highly breathable hiking shoe that is ideal for any terrain (read my guide on picking the best hiking shoes for your needs). Whether you’re hiking in the wet, pacific North West and need a durable shoe for stream crossings and the constant drizzle, or looking to hop boulders and scramble around scree in Rocky Mountain National Park, this shoe has got your number. What’s unique about these shoes is that the outsole uses rubber from a European tire company called Continental. According to Addidas, this otusole is 30 percent grippier than anything else available. Impressive. What I also love about these shoes is that they use the zip closure that Salomon introduced (but apparently failed to patent) with the XT Wings. OH — And they also have a mid-length hiking boot model, using the same technology, which I’d love to try out! 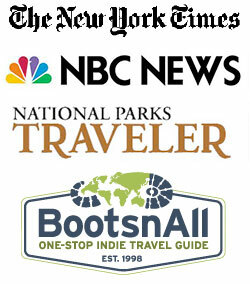 (Read my guide on picking the best hiking boots). Stacking up against the Adidas Terrex GTX are the Salomon XA Pro 3D Ultras, which I own and have owned for 4 years. I’ve purchased them twice as I’ve worn down my first pair (and am close to wearing down the second). Winner: Salomon X Ultra GTX. Why? Weight. 14 ounces lighter for the pair. That’s HUGE when you’re hiking any distance. Every step you take is 14 ounces lighter. If you hike 10,000 steps in one day, that means you’re lifting 8,750 pounds less for the entire day. I’d love to try the Terrex out solely for the purpose of their sole. If it truly is 30% grippier, the contest is a little closer. But even then, the X Ultra GTX win. Be ultralight, which at 3 pounds 10 ounces it sorta is. Be roomier and have more headspace than every other ultralight tent out there, which it definitely is not. I own the Big Agnes Fly Creek UL2 tent. It rocks. I’ve used and owned close to a half dozen backpacking tents over my life and there’s nothing I love more than the Fly Creek UL2. However, the biggest issue is headspace. It feels very cramped and claustrophobic in there. So when I read that the Mica FL 2 was designed for more headspace than the standard ultralight tents, I was ecstatic. BUT GET THIS: It has only .5 inch more peak height as the Fly Creek! Are you serious, North Face? See, this is why I hate marketing material. They sell you a bill of goods that, when thoroughly investigated, turns out to be a load of crap. (Granted, judging by the pictures, it does appear as if the Mica has more headspace where your head is, so it should mitigate some of the claustrophobic feeling of the Fly Creek). Winner: Fly Creek UL2. Hands down. Sure, the Mica FL 2 ‘wins’ more categories. It has half an inch of a higher height (whoopty do), .3 SQ FT greater of floor area (yippee), and 1 more vestibule for an extra 13 SQ FT of vestibule space (if you’re buying an ultralight backpacking tent, you’re a good enough backpacker that you don’t need 2 vestibules and that much space for your gear… remember, you aren’t car camping). All in all, the only single area that the Mica FL 2 beats out the Big Agnes Fly Creek is on the number of doors. Having two doors is a nice luxury. But don’t try and sell me a bill of goods that you are an ultralight tent with more headroom when you aren’t. Called out. 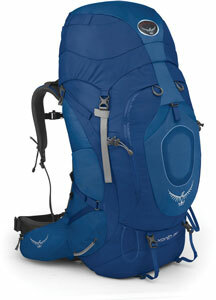 The Osprey Xenith 88 is one massive backpack. A far cry from the ultralight backpacks I’ve reviewed here. And with massive backpacks, the two things that matter are how it fits on your body and the suspension. There’s no way around it: Osprey reigns king over backpacks. Allyson owns the Osprey Aether, I own the Osprey Exos. Frankly, there’s no other brand we’d buy when it comes to backpacks (although we do own the REI Flash 18 and the Jetflow Raptor as daypacks, as well as the Kelty Coyote 80 from earlier backpacking days). Big backpacks are a tricky thing to compare. I really recommend going into the store and trying them out for yourself to see what fits you best. But what makes the Xenith 88 so impressive is the fact that you can choose between four shoulder harnesses. Yes, you read that correctly. You choose the shoulder harness that fits you best. The other main differentiating factors are minute details that make a big difference, including accessibility, ability to remove parts of the pack and how easy it is to insert a hydration bladder. I’m just as shocked as you. Before analyzing the specs, I figured Osprey made a larger backpack that would weigh less. Instead, they designed a luxury backpack that weighs more and costs considerably more. Now, I still recommend trying both on to see what fits you best. But from a pure analytical standpoint, there’s no reason to buy the Xenith. 88 Liters is a massive amount of space. You only need that amount of space if you’re backpacking around Europe, going on a 7 day backpacking trip without the ability to restock, or don’t know how to pack properly. I strongly recommend only buying backpacking gear that meets your specific needs. And for that reason, I’d recommend steering clear of the Xenith. It likely won’t meet your needs, or will exceed them to an absurd level. All links lead to the direct product page so you don’t need to do any searches. And for the REI Crestrail, you can learn more only at REI.com. Phew. That was long. 2,000 words long. But necessary. See, it isn’t always wise to buy the latest and greatest gear. Most of the time, their ‘features’ are a load of crap. Instead, analyze the specs and compare them with the best out there. I get why Outside Online made their list. And why they do it each year. It makes sense to do. But I prefer analyzing details and coming to educated conclusions so that myself and my audience knows the real deal. Did this help you? Then help spread the word! Share it on Facebook. Tweet it out. Pin some of your favorite pics on Pinterest. The Xenith is only 10 oz. heavier for 18 more liters of space. I guess it depends on if you need the extra space or not. I’d say the big drawback is the price. REI makes great packs though. I currently use an REI Lookout 40L pack for most of my hiking. Thanks for your insightful comment. Yes, 10 oz. heavier for 18 more liters of space is a great ratio. But 88 Liters in total is a massive amount of space that exceeds the needs of 99% of backpackers out there. The REI Lookout is a tremendous backpack. And good call on getting 40L. Being able to pack efficiently for a trip is a valuable skill.